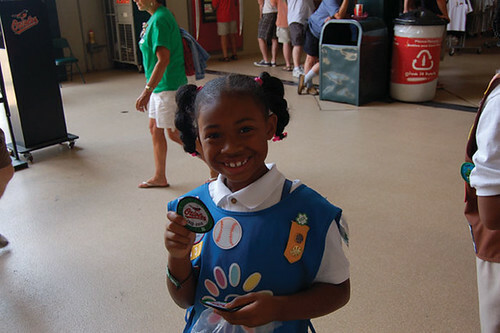 Girl Scouts hit it out of the park with Girl Scouts’ Grand Slam! 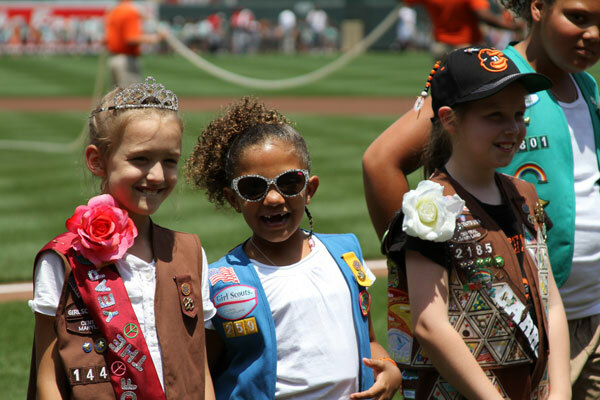 The Orioles pulled off the win over the Nationals, on Sunday, with 8,000 Girl Scouts cheering them on! We celebrated our 100th Anniversary Baltimore style, as Camden Yards was filled with Orioles orange and Girl Scout green, with many Girl Scouts-young and old-sporting their uniforms proudly. The day started off with 1,000 Girl Scouts in a first time ever Girl Scout Parade on the field…it was a sight to see and the opportunity of a lifetime for all who participated! The parade was followed by the presentation of the flag by local Girl Scouts and the Girl Scout Chorus leading the stadium in singing the National Anthem. Girls were so excited to be able to go on the field; the look on their faces as they saw all the fans in the stands and as the Oriole bird-clad in a Girl Scout sash-gave them high fives, was priceless. During the game, girls enjoyed green cotton candy, face painting, a flash mob, and trading SWAPS in the stands with other Girl Scouts between innings. All Girl Scouts received the one and only Grand Slam patch,* designed by local Girl Scout Jessica Miles, to add to their already decked out uniforms, and for several new Girl Scouts, it was their first patch! Many attended with their families, troops, and Girl Scout friends and spent the summer afternoon watching the game. GSCM’s Grand Slam Event was the perfect tribute to Girl Scouts’ past 100 years and a fabulous way to kick-off the next 100! Special thanks to GSCM Board Members and Grand Slam Event Co-Chairs, Wendy Emrich and Judy McGovern and the 100 Anniversary Committee for all their efforts to make this once-in-a-lifetime celebration one that won’t soon be forgotten. Our hats are off to you! Watch the video to see a recap of the celebration and check out photos on Flickr. Have photos and videos you want to share? Send them to communications@gscm.org. The Grand Slam Celebration was surely a hit for the record books; all of the fans in attendance enjoyed the Girl Scout fun, as well as the Orioles win! One last shout out to all of our Anniversary Sponsors and a big Thank You to all who participated and made this event a great 100th Anniversary celebration! *If you attended the game but did not receive your patch, please contact Emma Williams, ewilliams@gscm.org or call 410.358.9711, ext 244. Please provide your name, phone number and address.